This week we're delighted to announce the re-launch of our newly branded and upgraded Menopause Doctor website! 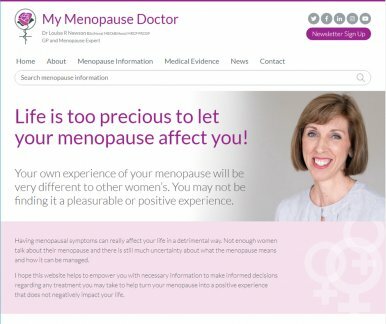 The two years since launching the original My Menopause Doctor website have proved both exciting and exhausting, with many thousands of women visiting the website each month and healthcare professionals reporting that they've found the hundreds of articles, videos and links on the site really useful, both to increase their own knowledge about the menopause and also as a resource to pass onto their patients. The re-design of the Menopause Doctor website is part of our overall project to launch the Newson Health Menopause and Wellbeing Centre in Stratford Upon Avon later this month. The clinic is being created to allow women to receive unbiased, evidence-based advice and treatment for their perimenopause and menopause and to be a centre of excellence providing care to women of all ages. We've been working really hard behind the scenes to completely restructure the website, to make it much easier for women and healthcare professionals to find the information they need to help themselves or their patients. We're delighted with the result and hope you will be too! Having menopausal symptoms can really affect your life in a detrimental way. Not enough women talk about their menopause and there is still much uncertainty about what the menopause means and how it can be managed. I hope the Menopause Doctor website helps empower you with the necessary information to make informed decisions regarding any treatment you may take to help turn your menopause into a positive experience that does not negatively impact your life.